Near the end of 2017, 3DHubs released the The 3D Printing Handbook which is an accessible design reference manual for the different 3D printing technologies available to hobbyists, professionals, and enthusiasts. The book covers different technologies, their strengths and weaknesses, and how to best design for their capabilities. It also has case studies of different 3D printing technologies and their impact in different industries. 3DHubs is a "3D printing as a service" site that connects people who want something 3D printed to people with 3D printers (and vice-versa, allowing 3D printer owners to provide a service.) Since the whole idea works much better the more people know about 3D printing, 3DHubs puts a lot of work into education to build familiarity with the concepts, with a large knowledge base with guides such as Practical CAD Modeling of Enclosures for 3D Printing. The new book is in a similar direction, aiming to be a reference for engineers, designers, and hobbyists alike. 3D printers are amazing tools, but they are not magic. Like any other manufacturing tool, a 3D printer has things that it is good at, and things it isn't so good at. A part needs to be designed in a way that works in harmony with the abilities of the chosen manufacturing method, a process knows as Design For Manufacture (DFM) and it's important whether you're just making one or two, or mass producing. 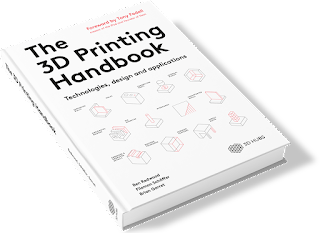 The 3D Printing Handbook is a reference manual that not only guides people in choosing between different 3D printing technologies, but also guides designers in applying sensible DFM for objects that will be 3D printed. That is the main focus of the book; a tour of what 3D printing technologies are available right now, their strengths and weaknesses, what industries they are used in, and basic DFM design guidelines for each. Everything is presented clearly and succinctly. Interested? 3DHubs has links to where you can buy the book in your preferred format.